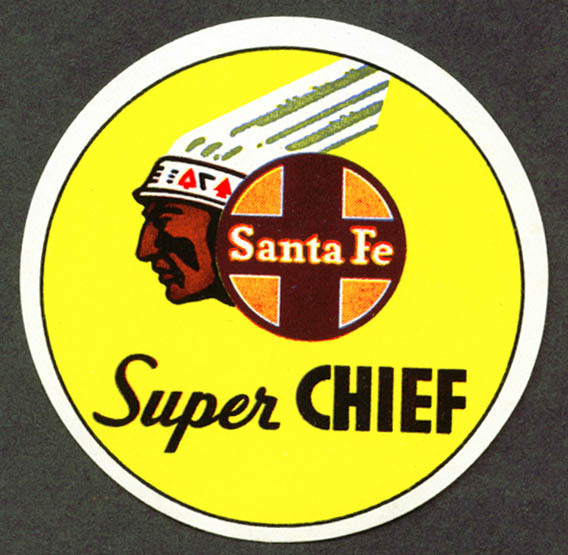 The Santa Fe Super Chief | A Continuous Lean. 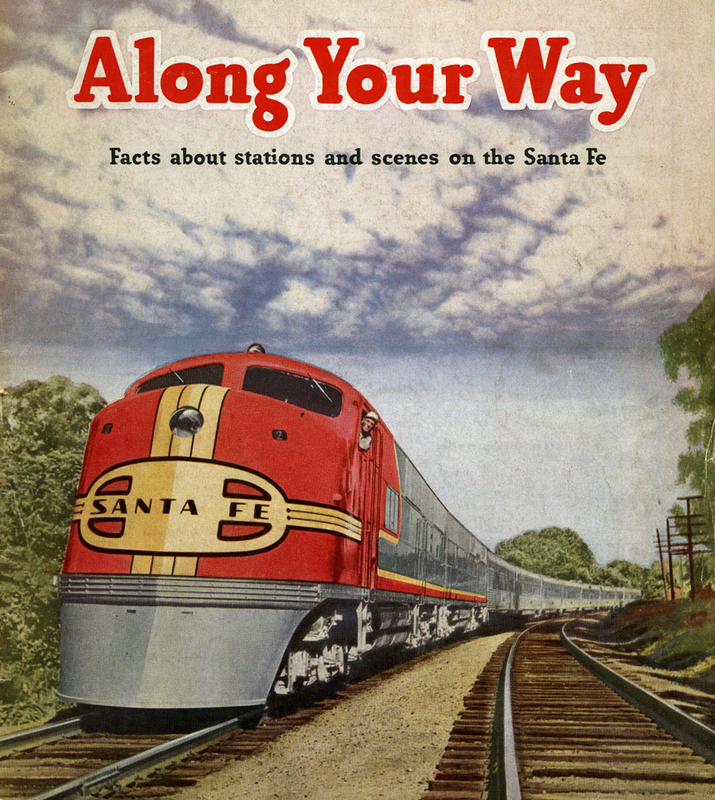 Starting in 1936, the Atchison, Topeka and Santa Fe Railway offered service from Chicago to Los Angeles on their luxurious new train the Super Chief. 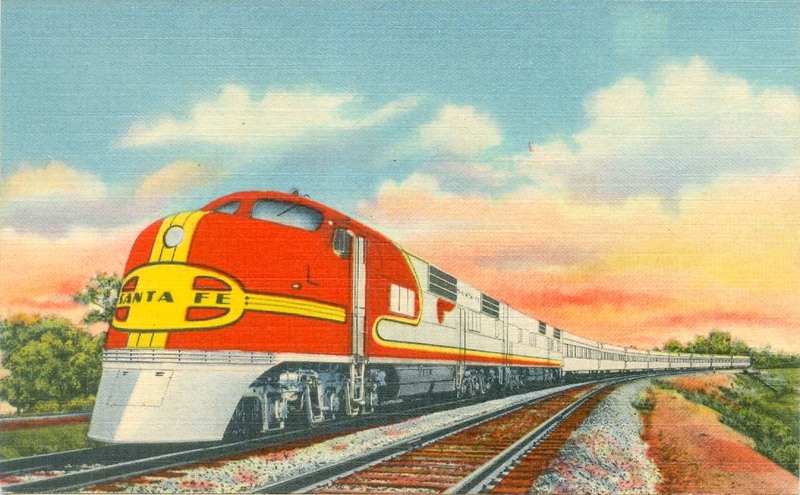 The line was the Southwestern-colored-art-deco-themed flagship service that became known as the “The Train of the Stars” because it was the preferred mode of transportation by celebrities traveling cross country. 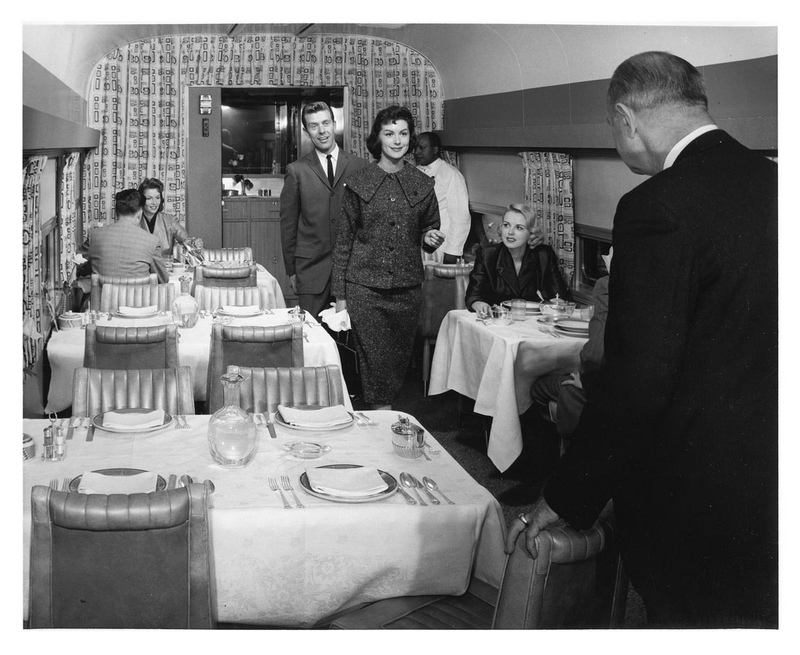 The Super Chief –which by 1937 was offering daily service – was the first ever all-Pullman sleeper car train in the United States and featured fine dining in the exclusive Turquoise Room. 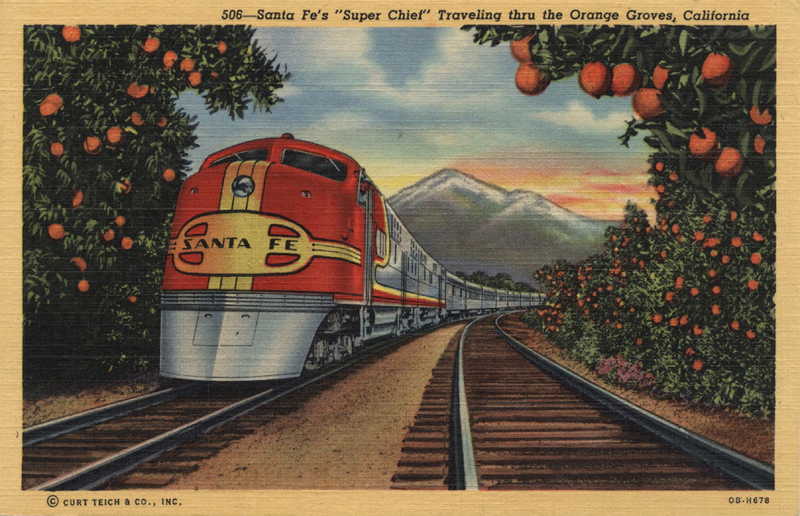 The Super Chief is one of the most iconic and recognizable rail lines in the United States and was the pinnacle of travel in its day. Eventually passenger railways were consolidated into Amtrak which ended the service in the 1970s. 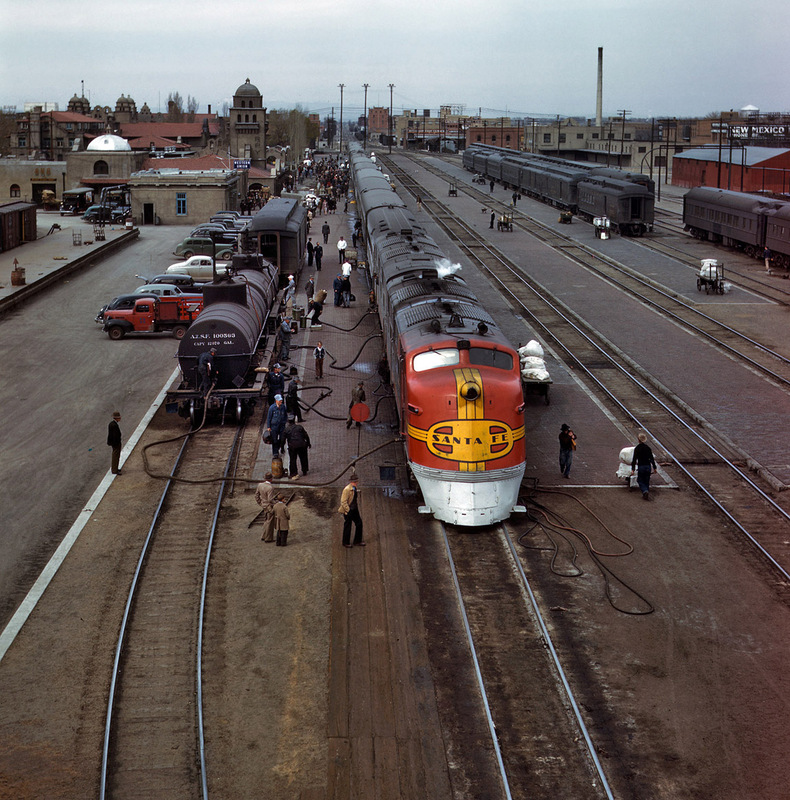 Today, the classic red and yellow styling lives on in Lego and old photographs like Jack Delano’s beautiful 1943 Kodachrome (top image) of the Super Chief being serviced in Albuquerque, NM. Great pictures- anyone else notice that the postcard with the orange grove and the next picture down are the exact same images, with an orange grove added/deleted? These vintage images are wonderful! Similar to flying back in the 50s – everyone “dressed” for the trip – What a great post!! Thank you. I love the grand historic train lines. My husband and I honeymooned on the Empire Builder from Chicago to Glacier Park then onward to Seattle in September of this year. Traveling by rail is a wonderful experience, and something that I hope more people get to experience. 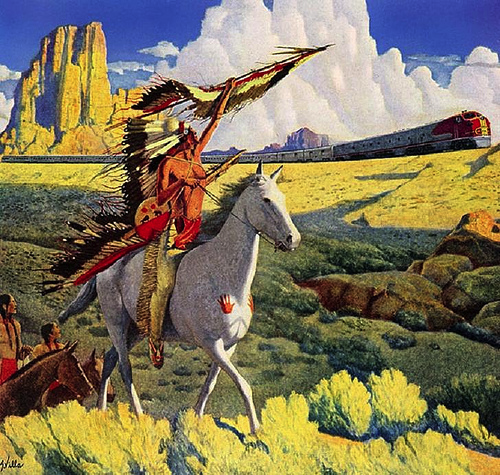 We’re planning on taking the California Zephyr and the Southwest Chief lines next – can’t wait! The Super Chief is definitely one of my favorite train designs, so iconic. Thanks for featuring! Interesting pictures, and actually a pretty sad commentary when compared to where we are today. Our current train system is decrepit crap & very third world in function. We now drive automobiles incessantly even if it’s just to grab a cup of coffee. We used to have really excellent passenger rail service in America for its time. The system we replaced it with is concrete freeways built out in the middle of nowhere to help perpetuate suburban sprawl along with cookie cutter, Weyerhaeuser particle board housing that MIGHT last a decade or two before going to the local landfill & Wal-Mart stores selling garbage made in China with a corresponding higher carbon footprint (not to mention the loss of U.S. jobs that actually made useful stuff). We need to get back to actually making stuff of value here in the United States. You mentioned LEGO, but what about Lionel Trains? Maybe a topic of future post. “Atchison, Topeka and the Santa Fe”…also a great song written by Johnny Mercer and sung by who else, Judy Garland. These trains are too expensive and commercial. definitely one of the best posts you’ve laid down. This reminds me of the Taggart Comet from Atlas Shrugged. Lionel Train also did a Super Chief version – you can still find the sets on eBay and in vintage hobby stores. I tried to get one for my Dad last Christmas, but they fetch a mighty hefty price. beautiful post MW. i am lucky enough to live a few short blocks from the brooklyn roundhouse in portland, oregon, home of the legendary SP&S 700, SP 4449 and the OR&N 197. standing in the shadow of one of these iron behemoths is a truly awesome experience, a stark reminder of the impermanence of today’s manufactured goods. i can only imagine the thrill of chugging cross country aboard one of them, seeing the landscape through a coal-tinged haze. at Pullman and oversaw all the workmenship on the inside of the cars. Said she remembers her dad talking about this project. It was this train that was behind the design ideas for Ford’s F250 prototype. I love, love, love your site. It is fantastic! Really evocative of the optimism of the time. Proof also that great design survives – my two sons both went straight for Santa Fe trains when they chose their own hobby sets! Agree with Jeremy – lets make more stuff of value. Even down here in Australia! 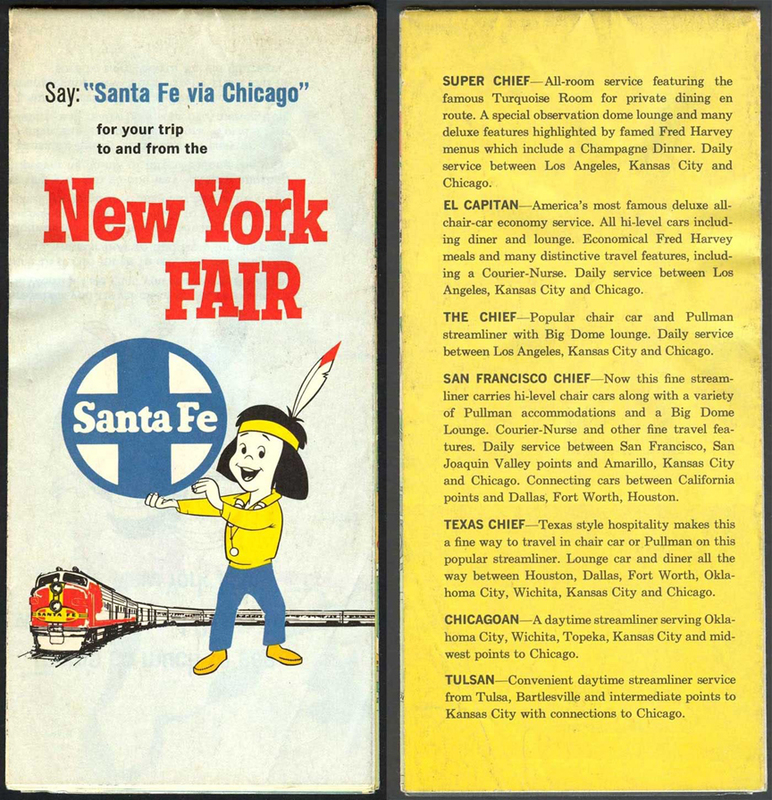 Really important to understand the context of the Super Chief too – the bright colors of the locomotive and sleek fluted stainless steel train cars were the product of pure American marketing and manufacturing genius. 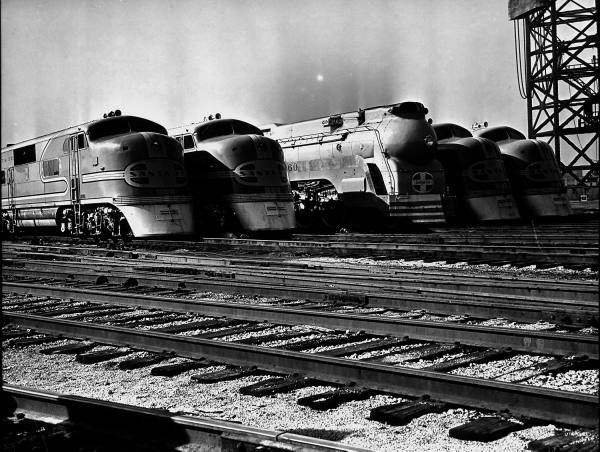 The locomotives were made by the LaGrange, IL, EMD division of General Motors and the colors were designed by the same GM Arts & Colors department that brought you the flamboyantly styled Cadillacs and Buicks of the 1930’s. The thought was to make diesel-powered trains relatively exciting-looking compared to the drab green steam-powered contemporaries. The stainless passenger cars were made by Edward Budd company of Philadelphia. Budd developed the stainless shot-welding process that enabled the making of stainless railcars that didn’t need paint and weighed much less than the traditional or “heavyweight” railcars of the time. Other great and colorful trains to check out include the Pere Marquette, the Southern Pacific Daylight, the Empire Builder, the Panama Limited, the Florida Special, and the Atlantic Coast Line Champion. Thanks for a great piece. I was blessed to get on a train as a 5 year old and get to go All the Way to LA from Joliet.. The Dome car was unforgetable.. Thanks for this post! What an amazing way to travel cross-country this must have been. Those traveling actually SAW the cities, towns, villages and vastness of the US that now we hop-scotch across when flying and miss the essence of America. Hopefully the new Federal ARRA investment in high speed rail exploration will bring new options. Great images but the Super Chief was not the first all pullman train on the railroad In 1892 they began running a train called the California Limited. Strictly deluxe, extra fare.